So far, the ruling Social Democratic Party of Kyrgyzstan (SDPK) has continuously promoted the close ties of their presidential candidate Sooronbai Jeenbekov with Persian Gulf countries. In the line of recent events, however, this quickly led to accusations against Jeenbekov who, according to some observers, is expanding his ties with foreign radical Islamist organisations. Jeenbekov is expected to continue the course of the current President, but another question is gradually gaining traction: which religious policy will he pursue if he still wins the presidential ballot? Will there, for example, be billboards everywhere depicting women in Paranjas [a Central Asian robe, covering the head and body] with the caption “Where we go, poor people”? It had already happened by the initiative of the current President Almazbek Atambayev who often called upon observing Muslims not to become radicals. The lawsuit was brought after the Central Election Commission had considered a complaint by Jeenbekov’s attorney Jyldyz Smanova who had requested to deprive 24.kg of its media accreditation to the elections. This demand was no surprise to the Election Commission, but in the end, the article was removed, and 24.kg offered Jeenbekov a free column to distribute canvassing material. The 24.kg news site has evidently not been alone in paying attention to the actions of the pro-government presidential candidate in repositioning the republic. There were frequent reports in the media these past months that he was allegedly strengthening his close ties with trading groups from the Persian Gulf and introducing some elements of “Life by Sharia” to Kyrgyz life. The Russian political scientist Arkadi Dubnov has, for example, said in an interview with “Kommersant” that on the initiative of the prime minister, “Life by Sharia” was allowed to distribute instructions for the Salah [Muslim prayer] within government buildings. 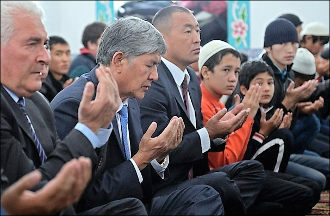 “From the beginning of Jeenbekov’s time as prime minister, they shared instructions on the Salah everywhere, even the seat of the government itself. And all of that apparently upon request of Jeenbekov. 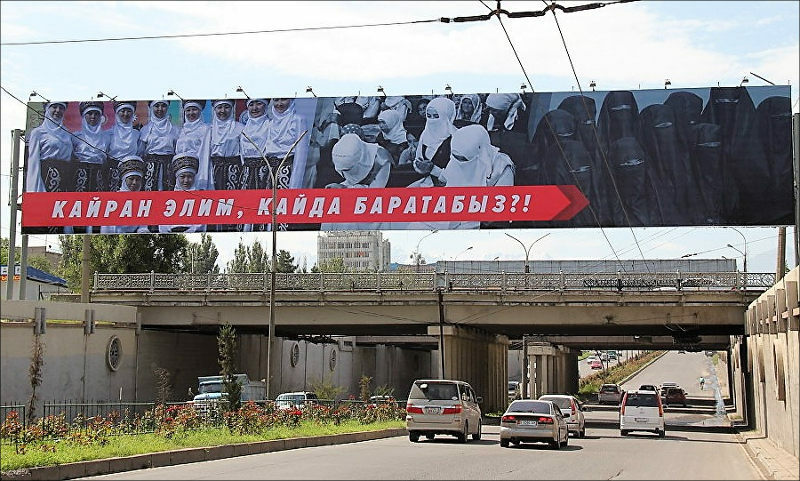 Moreover, interest in more radical forms of Islam is growing in the Southern Kyrgyzstan. All of that is alarming the secular parts of Kyrgyz society,” the expert said. It is most likely that Dubnov did not have the government in mind where the Salah is not yet practised, but rather Parliament, where deputies have decided to open up a prayer room for Muslims. Zamirbek Mambetjunusov, an expert on national security and former head of the CIS (Commonwealth of Independent States) anti-terrorism centre, is paying close attention to the fact that no research has been conducted to examine the hotbeds of radical Islam in Kyrgyzstan, while opening an Islamic prayer room in the representative body of all Kyrgyz is, in his opinion, infringing on the rights of other confessions. “I don’t think at all that prayer rooms in Parliament reflects radical attitudes in society especially as they were set up on the initiative of the Prime Minister. But the rights of other confessions have to be considered as well, so there should also be a possibility for Orthodox Christians, Buddhists and Baptists to pray,” Mambetjunusov said in an interview with Fergana. Kyrgyzstan’s development path places it only two steps away from the status of a failed state and has traditionally been described as Russia’s “small brother”, exhibiting heavy dependencies on Moscow’s resources both politically and economically. In the end, the acting President will always work towards friendly relations with the Kremlin. Kyrgyzstan’s membership in the Eurasian Economic Union as well as the removal of American military bases from the country bare evidence to that. That is also why Moscow’s views were taken into account in selecting the preferred candidate of the government. But recently both Russian and local media have reported more on the chosen successor’s religiosity, his ties to the Arab world than on Jeenbekov’s commitment to Eurasian integration. It is important to keep in mind that the pro-government candidate’s brother, Jusupbek Sharipov was officially representing Kyrgyzstan’s interests in Saudi Arabia these past years and was one of the main drivers behind the decision to cut Bishkek’s ties with Qatar, which has been isolated even by its Islamic neighbours. A few months ago, other Arab countries ceased official ties with Doha, among them Saudi Arabia, Bahrein, the United Arab Emirates, Egypt, Yemen and Libya. Officially, Qatar stands accused of financing terrorist organisations, in particular, Al Qaeda and “Islamic State”. Adil Turdukulov, who is heading the “Republican Committee to Defend Freedom of Speech“, believes that Jeenbekov will have to answer some questions about a “possible radicalisation of the country” if he is elected President. In an interview with Fergana, Turdukulov made the point that the long stay of Jeenbekov’s brother as ambassador to Saudi Arabia indicates that the SDPK’s presidential candidate must have been fine with this diplomatic posting. Moreover, Turdukulov underlined that he had no indications that the Jeenbekov family had any ties to radicals or received any support at all for his presidential run from the Arab Sheikhs. But as the controversy around the levels of the presidential candidate’s religiosity continues in Kyrgyzstan, trial hearings could be held on yet another matter. It is because the participation of religious figures in election campaigns of candidates is forbidden by the Electoral Code as well as the laws on religious organisations and religious freedom. Muftis are equally banned from using mosques to promote electoral campaigns. On 20 September, however, a video appeared online that showed a speech by mufti Chubak Ajy Jalilov, in which he talked about the qualities of Sooronbai Jeenbekov and how beneficial his election would be to the country. Activists brought this case before the Central Election Committee and demanded the former mufti to be sanctioned for campaigning and for supporting a specific candidate. Adil Turdukulov meanwhile is worried that religious figures have begun to increasingly meddle in politics and sees this as an indicator that the clergy’s influence over the secular state is rising. On 12 September, the Pervomaisky District court in Bishkek sentenced the Kyrgyz journalist Zulpukar Sapanov to four years in prison for “inciting religious discord between Muslims and Christians” in a book. There, the author had investigated the pagan faiths of the Kyrgyz people and concluded that today’s religious authorities are imposing the belief in Allah on them. The leaders of DUMK were appalled by the book’s publication and filed a complaint with the General Prosecutor against Sapanov for insulting the religious feeling of Muslims. “The arrest of Zulpukar Sapanov visibly demonstrates the influence of religion on the judicial system,” says Turdukulov. Kyrgyzstan’s ombudsman Kubat Otorbayev equally criticised the ruling, saying that the verdict substantially infringes upon the citizens’ constitutional rights. “After the sentence, I got acquainted with Sapanov’s book, and I think that his work must be interpreted in a wider context than the religious canon. What I see is a freedom-loving man who does not only have a citizen’s perspective about today’s most pertinent problems but also tries to grasp the context of past tragedies, wars and the other bad things that have happened – all of which accompany mankind for the past 200 years,” the ombudsman said. Those observers who link the rise of Islam in Kyrgyzstan to stronger ties of Bishkek with the Arab monarchies are forgetting that these contacts had always been partly symbolic. Thus, regarding international trade, only economic relations with the United Arab Emirates had a volume worth mentioning, and there are no larger economic projects to speak of. In the absence of progress in the mutual trading relationship, the last two decades saw an expansion of cooperation among religious institutions in Kyrgyzstan and Persian Gulf countries. Neither Kuwait nor Saudi Arabia was interested in investing any outstanding amount in the Kyrgyz economy, but then subsidised the construction of mosques whose number was growing faster than that of schools and hospitals. According to the Interior Ministry, the number of mosques in Kyrgyzstan rose by a factor of 70 since Independence. 2,743 mosques are active in the country today when there were just 39 during Soviet times. Apart from the construction of mosques, the first Madrasa Schools [religious educational institutions] were opened and are equally financed from abroad. And people who had studied at institutes in Egypt, Saudi Arabia, Jordan and other Arab countries started to work in Kyrgyzstan. In the words of Esen Usubaliyev, director of the think tank “Rational Decisions”, it is the state’s fault if the speed of mosque construction is exceeding that of schools for lack of funds in developing the educational sector. Interviewed by Fergana, the expert underlined that mosques are built by foreign donors, but schools have to be paid for from the state budget. But he also believes that Kyrgyzstan has tacitly become the key region for steering illicit flows of cadres and money for different extremist religious organisations. And if important terrorist and extremist organisations are banned in other Central Asian countries, they may still operate completely legally in Kyrgyzstan. “Of course, controls are tighter now, but people from different religious movements have always felt free here. And since 2011, when the conflict in Syria began, Kyrgyzstan has become the main source of recruits to fight there,” the expert points out. Since the break-up of the Soviet Union, the movement “Tabligi Djamaat” that is considered extremist in Tajikistan, Russia, Kazakhstan and Uzbekistan has been able to entrench itself in Kyrgyzstan, Usubaliyev stresses. Since then, it has strengthened its position in the Republic considerably and is acting completely legally. A few Russian media outlets have reported that the other brother of the pro-government presidential candidate – Asylbek Jeenbekov – is allegedly supporting the activities of “Tabligi Djamaat”. If we take into account that Kyrgyzstan has just begun its way to becoming a secular society, then the religion of the candidate would be the last topic for discussion or any speculation. But the laws of democracy have to guarantee tolerance towards any confession as well as the free choice of any religion. And in case that there is a reason for concern around these questions, the state must guarantee security to its citizens, regardless of religious disagreements. After all, the entire purpose of secularism is that the state is defining civil, and not religious, norms.